The temperature soared to 102 a few weekends back and this guy gained six inches of height in one weekend. I am so sad this plant is an annual. Stick around, why don't you? Everything in the front yard behaved like a champ in the searing heat, although my poor Fatsia japonica in the backyard was scorched. Writing about these two plants in the same post makes me realize why they call Fatsia "false castor oil plant." They have very similarly shaped leaves. Also scorched were my beautiful lilies. They were the prettiest white with a yellow center. I hate the heat so much; I would be lost without my air conditioning. Luckily the heat turned my Angelica stricta purpurea from a lavender monster into the dark purple beauty I wanted and now I love it again. Especially flanked with Crocosmia 'Golden Fleece' and Knautia macedonica. I can't wait for these two to self-seed and expand next summer. I told Greg that I want to harvest the castor bean seeds so I can always have a plant in my yard. He's freaked out about how poisonous they are. I said I wouldn't harvest the seeds if he would buy me a new start next spring, and he agreed. So, what else should I tell him is poisonous? I think I could really increase my spending power if I can convince him that some of my other plants' seeds could kill him. Quick, what's on your too-expensive-to-buy-dream-plant list? For the full show of bloom day entries, head over to May Dreams Gardens. I bought two packages of castor bean seeds in the spring and planted them around, hoping they would either discourage or poison the gophers. No luck on that count, but they are my favorite plants right now. The one in the veggie patch, where R waters and fertilizes has gone ballistic. I'm harvesting those seeds, on the theory that there is plenty of other stuff around the house that can kill ya. I'll be very careful, I promise. Oh man! Finally we get some heat the year I don't plant a Castor bean! Yours is looking FABULOUS! Ya know I had a local Portland gardener tall me she never buys them anymore because they just naturally seed around her garden, so maybe you'll get lucky (I hope Greg doesn't read your blog). Do they sprout pretty easily? Did you have to prep them in any way? I have a bad track record with growing things from seed. Thank you! I'm definitely going to save the seeds. I just need to label them so I don't accidentally eat them or something. I feel the same way about autumn joy! That pale pink stage is so scary--will it stay that way? I was promised better! 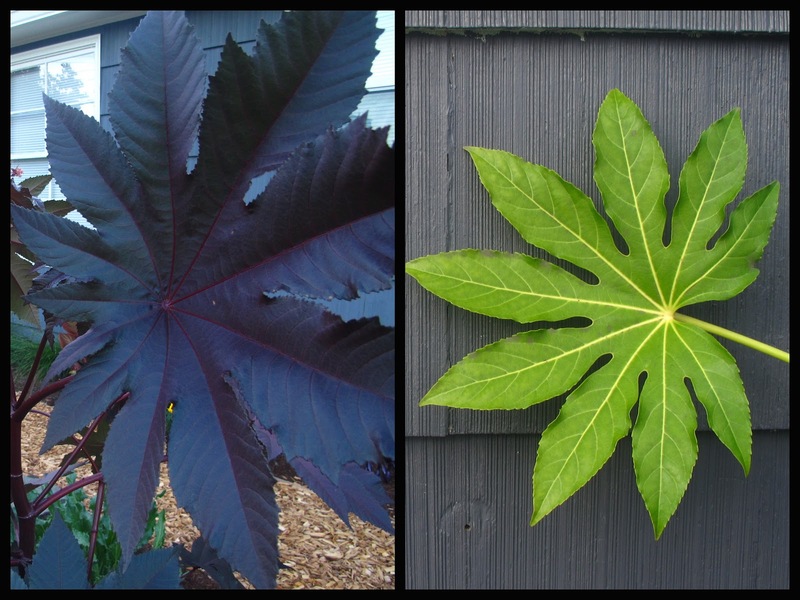 Love that Castor bean. I was freaked out about its poisonous qualities (with a toddler grandkid that *could* be just silly enough to eat the fruit) but he'll be older next summer and can watch out for himself! The 'Golden Fleece' will expand but it's not a particularly fast mover for me after several years. Tell Greg it's poisonous? I hope that migraine goes away, poor thing. AND THOSE POOR LILIES! They look so sad & brown & burnt. My jades got burnt and I nearly cried. I am still plagued with guilt because they are potted and helpless and I put them outside for a few days and went to the beach. FOR SHAME.